A diving vacation in Costa Rica is on every diver’s bucket list! Rich biodiversity and expert local knowledge make your trip seamless and unforgettable. Visit the best diving spots in Costa Rica! Begin your vacation by staying at the beachfront Flamingo Beach Resort, then travel south to the majestic Osa Peninsula where you will stay at the great Aguila de Osa. While you're in Osa you will get to visit the astonishing Caño Island, one of the greatest diving spots in the world. See whales, dolphins and other sea creatures in this unforgettable trip! Explore Arenal´s majestic volcano and myriad of eco-tours. Then stay in an exclusive property and scuba dive near the world famous Catalina Islands! Populated with exotic marine life, the subaquatic environments of Costa Rica’s coasts are like otherworldly landscapes of a far-off planet ready to be explored. These rich habitats are all yours to discover with help from local experts, who can customize your diving vacations in Costa Rica to fit as much adventure or relaxation as you want. Contact us and tell us about your dream vacation. Our travel consultants will gladly help you make the right choices to make this the diving experience of a lifetime! Part of the allure of diving vacations in Costa Rica is choosing where to begin your deep-sea adventure. With one of the widest forms of biodiversity in Central America, Costa Rica offers a range of species and difficulty levels to dive into. If you are not sure where to start, check our customizable scuba diving packages. These excursions focus on some of the best diving sites in Costa Rica with all they have to give. In addition, for the duration of the trip, you are in the experienced hands of diving professionals. Their years exploring Costa Rica’s seas make the journey more exciting and informative. Whether you are just starting or are a seasoned diver, the proper guidance can make the journey fuller and the results more plentiful. Travel at the right season and to the ideal spots to discover the marine wildlife you want to see. Certain locations in the country offer more chances to observe specific types of wildlife or habitats. However, most diving in Costa Rica takes place along the Pacific coast. Here there are many spots to jump into a whole different meaning of what natural abundance is. There is a large variety of colorful and exotic marine wildlife in some of its shallow waters. This the depth to spot everything from octopi to damselfish. Experience unique Costa Rican diving adventures and find white-tip sharks, pufferfish, and even stingrays lounging among rock formations. Each area has its advantages and it’s important to decide what you want to cover. Simply tell us what you’d like to experience and your level of expertise, and we’ll make our best to put you where you’re most likely to find them. If you are not sure where to start, don’t worry. With our professional help and advice from local experts, you’ll be swimming along the ocean floor in no time. Flamingo beach, also known as Blanca (White) beach, in Guanacaste, is a great place to start tour diving adventure. Here embark on thrilling diving expeditions around the Catalina Islands, located just off the coast from Flamingo and Ocotal beach. 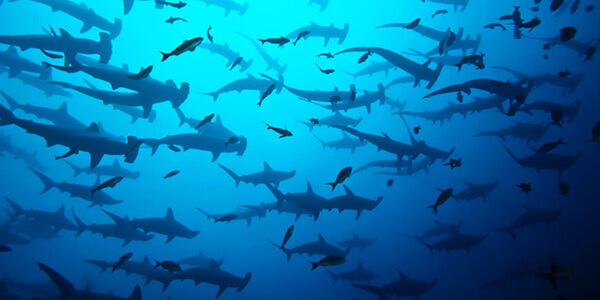 The islands are highly regarded dive sites that feature large pelagic species. They also have unique underwater structures, such as arches, caves, and vibrant coral. Here you can spend a morning searching for even the shyest of wildlife. From there, travel to the South and to Osa Peninsula, one of Costa Rica’s most biologically diverse regions. Dive the waters surrounding Caño Island Biological Reserve, widely considered to be one of the best spots for scuba diving in Central America. Head to one of the five designated diving locations and ready yourself for a show. Descend to depths of more than 100 feet in search of some of Costa Rica’s most exotic marine life. Spot octopi, eels, angelfish, jacks, snappers, and grunts. With some luck and patience, get a glance at turtles, orcas, and dolphins. Depending on the season, there are even humpback and pilot whales in these waters. Costa Rica’s famed biodiversity is not only in its waters. Take full advantage of your stay in Costa Rica’s coasts and explore the seaside. Head to the jungles in Manuel Antonio or the Osa Peninsula to admire the expansive forests of the country. Make contact with abundant flora and fauna at every step, discovering sloths, iguanas, and exotic flowers. In addition, these areas offer the opportunity to see the sea from other perspectives while practicing water sports. Go stand up paddling or kayaking to learn more of this plentiful country. Find rays, turtles, and coral reefs not far away from the coast. Or simply enjoy the waves at the nearby beach, and surf during the afternoon to experience the true meaning of Costa Rica’s Pura Vida easy-going lifestyle. If you want to experience even more of Costa Rica, you can also customize your Costa Rica vacation package to include other areas. Visit the Arenal volcano to admire the vibrant cloud tropical forest with its monkeys, colorful birds, and adventure tours. Or relax at the hot springs, surrounded by green vegetation. Whether you’re an experienced diver or have never strapped on an oxygen tank before, you’ll be provided with everything you need for your scuba diving in Costa Rica. With friendly, knowledgeable dive instructors and some of the most incredible underwater environments in the world, these expeditions will be unlike anything you’ve ever experienced. Experienced divers (more than 50 dives under their belt) are most likely to enjoy Catalina Island and Bat Island. There’s plenty chance to spot large marine life in these areas and the visibility in this are is the best during late dry season.